The payment system within the application has the following functionality out of the box. Simply clicking Take Payment on an Invoice to take payment. Clicking Take Payment on an Invoice and applying an amount less than the total balance due. Allows you to take over-payment and apply remainder to Customer record as credit. After taking over-payment, you can apply the credit by going to the Customer's page > Payments section, and Apply the remaining Credit. In the example below, the Customer owed $32.85, and paid $100. A Customer record can have multiple open Invoices. When the Customer makes a payment, you have the option to split the payment towards the different balances on the Invoices on tied to their record. For partial / Split Payments: You can track un-settled payments in Admin > Reports > Un-Settled Payments. Quick payments are generally not recommended for non-Admin users. 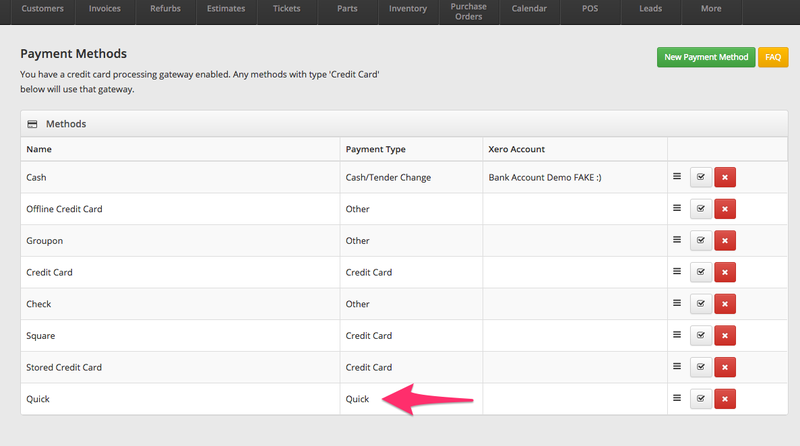 However, this feature allows you a way of marking an invoice as paid with a single click. It creates an automatic quick payment on the invoice. Generally it is recommended that you apply payments through the payment form and capture the payment type. Please note that Quick Payments also do not prompt for closing a ticket. Store Credit in the app works sort of like you might think of a gift card, or deposit payments. The payment system also supports Deposits. For more information, refer to our Deposits Article. Please refer to our Refunds article for more information. 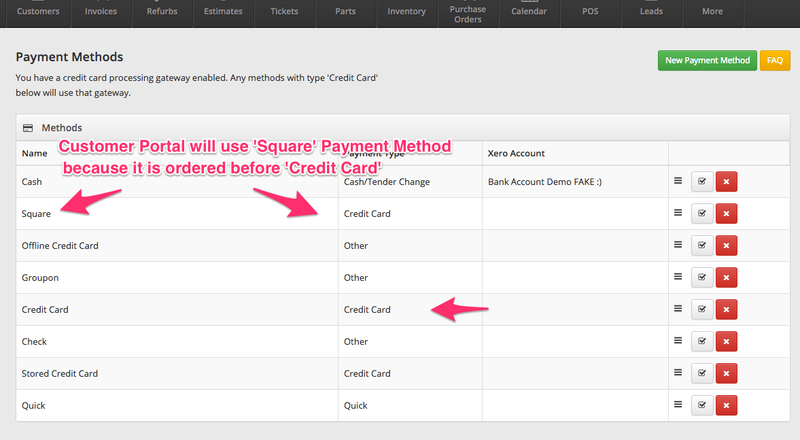 You can adjust your payment methods in Admin > Payment Methods. The first payment method in the list that has Payment Type 'Credit Card' is the one that will be used when customers pay through the customer portal. Bad Debt happens when a customer refuses to pay for an invoice. In order to track the unpaid invoices, you will need to create a payment method called "Bad Debt"
Once that is done process the invoice as you would any other invoice but use the "Bad Debt" Payment method this will mark the invoice as paid and give you the ability to track these types of invoices. Once you have the proper items in your cart, click the green "Cash" button to take a cash payment from the POS. The total will be displayed, and you can enter the amount of cash that the customer gave you in the "Amount Provided" box. The app will calculate the change needed to give to the customer and will display this in green text after the word "Change:". Once you have the Invoice details page up, click "Take Payment" to take a payment on that invoice. Select "Cash" for the "Payment method" drop-down menu. The "Payment amount" box is how much of the given cash you want to apply to the invoice. If you want all of the cash given to apply to the invoice, enter in the total for the invoice here. You can enter the amount of cash that the customer gave you in the "Amount Tendered" box. The app will calculate the change needed to give to the customer and will display it after the word "Change:".